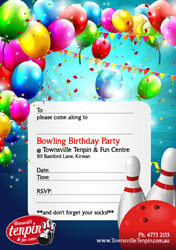 Our staff at Townsville Tenpin & Fun Centre will make your birthday party one to remember! Themes available depending on what is in fashion at the time. BYO decorations setup $50 per hour. Interested in having your party with us? Give us a call to plan that perfect, stress-free party or fill in the form to the right! Book your child’s birthday party here.